Shopping for the latest motherboard can be a confusing process especially to new users. With a lot of great looking boards, it's not hard to base ones final decision on looks and a little on price, rather than the overall value. The value can include things often ignored like extra integrated components that increase performance and compatibility, plus design improvements and feature enhancements. Software support and reliability are also keys to defining the end user experience. 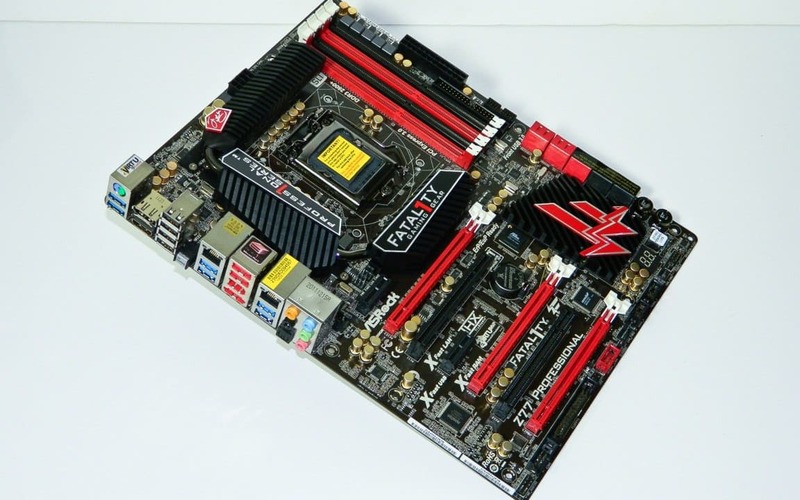 Today, we have a selection of leading Z77 motherboards that support the new Ivy Bridge CPU. 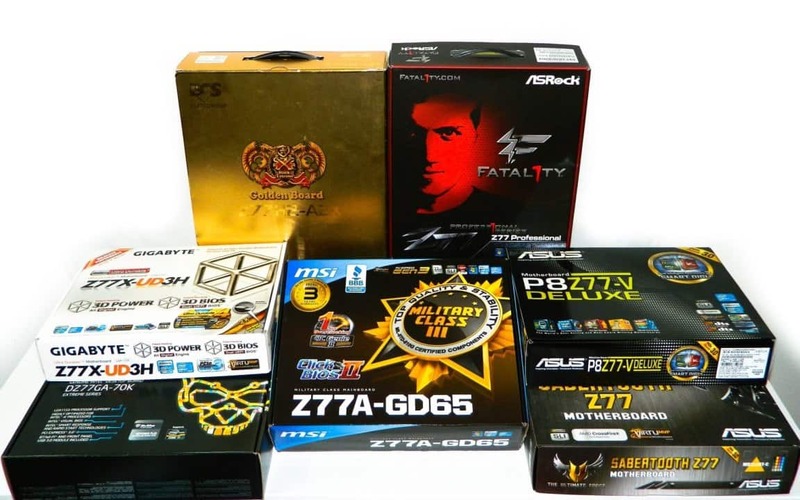 We've assembled a wide range of boards for price conscious users, gamers and professionals and will take a detailed look at the ASRock Fatal1ty Z77 Professional, ASUS Sabertooth Z77, ASUS P8Z77-V Deluxe, ECS Z77H2-A2 Gold Edition Extreme, GIGABYTE GA-Z77X-UD3H, Intel DZ77GA-70K Extreme and MSI Z77A-GD65 Military Class III motherboards. They all promise a lot but can they deliver on features, performance, value and a positive user experience? Let's find out! With so many boards in this round up, it's hard to digest all the similarities and differences that set them all apart. 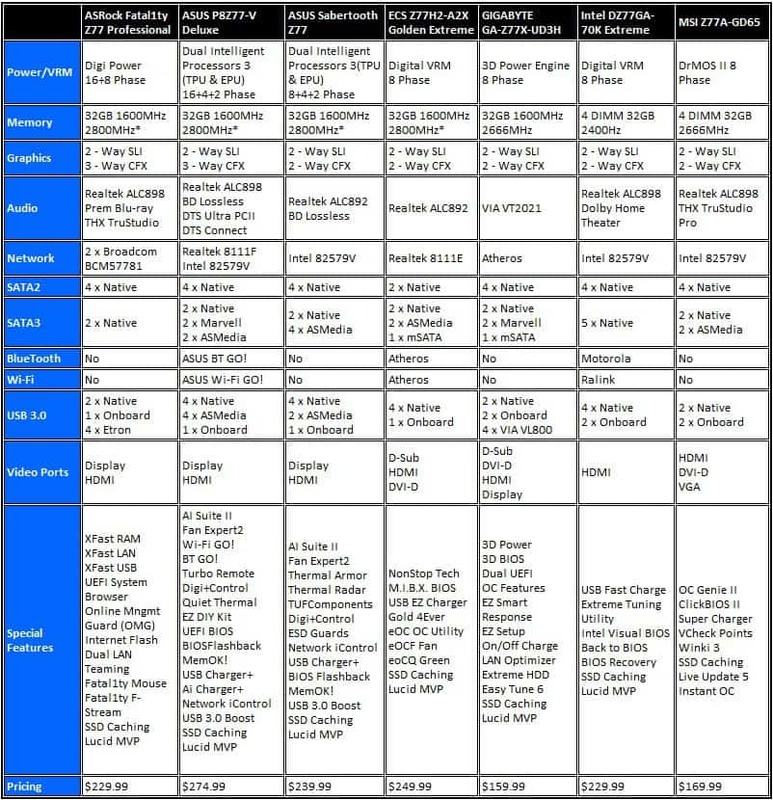 To give you a quick snapshot, here is a handy comparison table to show you the major differences between this field of competitors. Intel Smart Response (SSD Caching), Fast Boot and Lucid MVP are present on all Z77 boards. SSD Caching turns your system into a responsive, agile computer simply by adding an affordable 20-64GB capacity SSD without having to maintain a separate drive for programs only. This is a feature that really set the Z68 apart from the P67 when it came to a real tangible benefit. You can see that different integrated components are used in audio, networking, storage, connectivity, video out and other areas. For example, the ASMedia USB 3.0 controller is currently a better solution than the NEC (RENESAS) due to price and UASP support. The Realtek network controllers, unfortunately, use up some PCIE Gen1 bandwidth. GIGABYTE implemented a VIA VL800 USB controller which is used in USB Hubs meaning the ports require a loaded driver to be active unlike the native Z77 USB 3.0 ports. There is an unnecessary IDE port on the ASRock which isn't listed. This field of boards all have extra PLX controllers that move the PCIE bus along. If you want PCIE 3.0 performance, you'll also need an Ivy Bridge processor as Sandy Bridge is only PCIE 2.0. Some boards like the ECS Z77H2-AX or ASUS ROG series have a bridge chip that allows the board to support PCIE 3.0 no matter what processor you have installed. Expect standard PCIE 2.0 performance from the bottom PCIE x4 slot as well. Lucid MVP does more than just enable Intel Quick Sync. HyperFormance pairs Ivy Bridge's DX11 integrated graphics processor with a single GPU to improve frame rates in games. Gains depend on the resolution and graphics settings. High resolution screens (1920 x 1200/1080p) with high graphics settings will see about a 20% gain. As you drop game settings, frame rates increase. Lower resolutions will experience much higher percentage gain which is where Virtual VSync comes in to play. Virtual VSync controls video tearing that occurs when the graphics render more than 60 frames per second (fps). V-Vysnc takes those unneeded duplicate frames out that cause tearing. While regular VSync limits the frames to 60fps, Virtual Vysnc lets you flaunt those higher frame rates too (see our story and video). Keep in mind that any current Lucid Virtu MVP software is compatible with a single GPU (one graphics card) and not NVIDIA SLI or AMD CrossFireX (see this post for details). You won't be able to utilize any of the integrated CPU features. As it stands, it isn't on the motherboard manufacturer's list of things to license and therefore not in any immediate plans to update. Let's introduce the players shall we? The Fatil1ty series comes in three different models at different prices points; Z77 Professional, Z77 Professional-M (micro-ATX) and Z77 Performance. While there are a few differences in audio and game ports, NVIDIA SLI and AMD CrossFireX is standard on all. The Professional offers all the Intel Z77 features including 3-Way CrossFireX. The board has 16+8 Power Phase which means there should be some overclocking muscle. High end audio is often associated with pro gamer boards but this time around users only get a Realtek ALC898 audio processor. Good implementation will make or break the THX TruStudio audio quality. 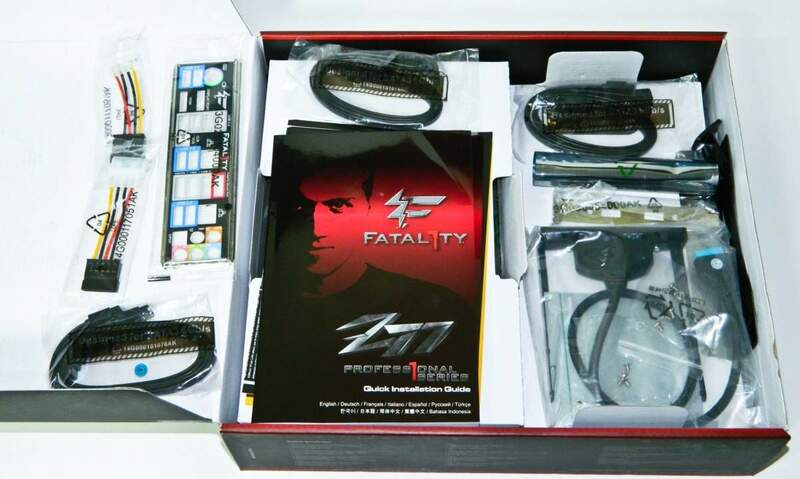 A Fatal1ty Mouse Port (USB) offers 125 Hz to 1000 Hz polling rates using the F-Stream utility. There's a total of 11 native Z77 SATA ports including the I/O eSATA on the back. The board includes a CLR CMOS button for resetting your BIOS as well. A power and reset button can be found near the SATA which may be tricky getting to if your cables are chaotic. The board features gold capacitors which are touted as better quality but appear to just be recapped to support of the Golden Extreme theme. ASRock chose to support two Gbt LAN ports with a Broadcom BCM57781 network controller. 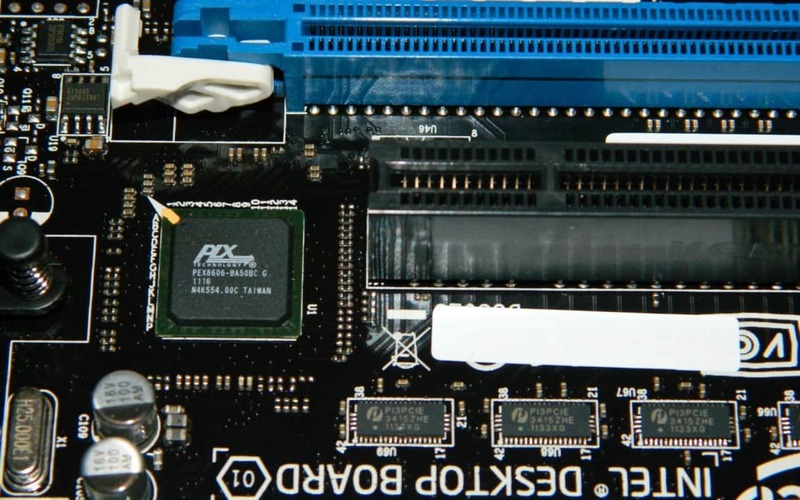 In terms of layout, most headers are oriented to the outside of the board with the exception of one near the top PCIEx1 slot and a long-since-dead IDE connector near the24-pin power which just needs dropped. Overall, you can tell this is a gamers motherboard. ASRock bundles quite a bit of everything with the board. Aside from the documentation and software, there are four SATA cables, SLI/CFX VGA bridge, 3.5" USB 3.0 expansion dock with PCI adapter, IO shield and two 4-pin MOLEX to SATA power adapters. The MSRP on this is $229 US.